CATBALOGAN, Samar – The Department of Interior and Local Government (DILG) represented by Hon. Jesse M. Robredo signed a Memorandum of Agreement with the Samar Island Partnership for Peace and Development (SIPPAD) represented by Most Rev. Bishop Emmanuel C. Trance, Bishop of Catarman; Most Rev. Isabelo T. Abarquez D.D., Bishop of Calbayog and Most Rev. Bishop Crispin B. Varquez D.D., Bishop of Borongan on the occasion of the 15th SIPPAD Assembly held in Catbalogan last September 22, 2010. 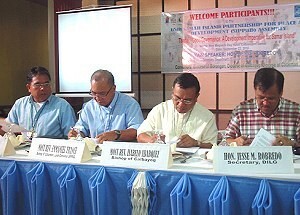 Secretary Jesse Robredo (right) signs MOA on good governance for Samar Island with the 3 bishops. The signing, which highlighted the activity, was intended to establish commitments from both the government and the private sectors in pursuing an honest and effective governance. The move was in response to President Noynoy Aquino’s call upon every citizen to get involved in a change that will alleviate poverty and offer equal opportunities to everyone, SIPPAD stressed. Focusing on the forum’s theme,” Good Governance: A Development Imperative for Samar Island”, Robredo shared his leadership experience as Mayor of Naga City for nineteen consecutive years where he effectively mobilized and engaged Civil Society Organizations (CSOs) as partners in promoting accountability and transparency in his local administration. The Samar Island Partnership for Peace and Development (SIPPAD) is a partnership of the church, CSOs, the academe, LGUs convened by the three Bishops in the three provinces of Samar Island whose vision is to promote peace and development, good governance, protection of its environment, and alleviation of poverty in Samar. The said organization existed since 2004 and has been addressing those issues even before the MOA was formally signed. SIPPAD and DILG, having shared common interests of promoting good and responsive governance, entered into this partnership with the commitment of improving the lives of the Samarnons. Based on the MOA signed, the DILG commits to acknowledge the citizen’s participation in governance through the provincial arms of SIPPAD, in development planning, budgeting, implementation monitoring and evaluation of government projects in local governments; ensure the access of information on government transactions; respond with prompt and appropriate action on issues raised by SIPPAD; adhere with the establishment of special development bodies provided by the Local Government Code; provide linkages to concerned central and local government authorities for decision making and provide a mechanism for the regular consultation with SIPPAD to address the issues of good governance. On the other hand, the SIPPAD will ensure transparency and accountability by involving in the above activities without violating the fiscal autonomy of the local governments concerned. It shall participate in the enhancement of existing programs and policies or development of new policies in the local level. It is committed to submit regular and special reports to DILG on the results of its involvement, prepare a report to the public such as “Ulat sa Bayan” or “Score Cards” on the performance of local government units in governance. Moreover, it will serve as the Service Provider to local government units in planning and budgeting implementation, monitoring, evaluation, capacity building, participatory research. Finally, the SIPPAD will serve as avenue for sharing of experiences and best practices in good governance. SIPPAD asserted on its independence as a body by not allowing the DILG to allocate funds for the purpose. This multi-sectoral effort was very well appreciated by Sec. Robredo. “We will not only engage with the opposition, but with everyone. Good governance and good politics can get together. Once you share power, they will return it back to you.” were the secretary’s words of wisdom for the guests present in the assembly. TACLOBAN CITY – The Overseas Workers Welfare Administration regional office 8 (OWWA-8), disclosed and cited the 2010 Model Overseas Filipino Worker Families of the Year Award (MOFYA) for Region 8 in an awards rite dubbed as “Parangal sa Matatag na Pamilyang OFW”. 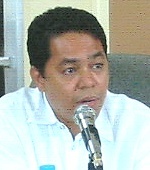 According to Marites Viñas, Department of Labor and Employment (DOLE) Chief North Leyte Field Office, the MOFYA aims to acknowledge the outstanding performance of an OFW in uplifting the lives of his family members and contributing to the community by establishing business sourced from an income of OFW thus creating employment. Ms. Viñas, representing DOLE Region 8 Director Forter Puguon who was the chairperson of the screening committee, announced the 2010 model OFW during the regional awarding of MOFYA at Ritz Tower de Leyte, Tacloban City on October 01, 2010. Ms. Viñas said that the dollar remittance of an OFW is a big contributing factor to national development thus increasing the purchasing power of peso. The 2010 model OFW award was categorized into two, the sea-based category and the land-based category. The 2010 model OFW Family, sea-based category, was awarded to Capt. Rufino Reyes, Jr. and his family. Captain Reyes who is from Tacloban City is into Internet Café business. The family received P120,000 G-Cash Globe Telecom, P20,000 Pass Book courtesy of Banco De Oro (BDO) and P150,000 insurance coverage courtesy of Philamlife. For the land-based category, the 2010 Model OFW Family is Mr. Alex Bello and his family, from Tacloban City. Mr. Bello was represented by his wife Mrs. Evangeline Bello, a registered nurse and a former OFW who is into Parlor business. The family received P120,000 G-Cash Globe Telecom, P20,000 Pass Book courtesy of Banco De Oro (BDO) and P150,000 insurance coverage courtesy of Philamlife. Mrs. Bello when asked what was the reason for there success, she commented that open communication between and among family members is a must to strengthen the relationship, and most especially God’s guidance, she quickly added. TACLOBAN CITY – One of the requirements of the law is that a candidate in the Barangay and Sangguniang Kabataan elections should be able to read and write in Filipino or in the local dialect. In other words, literacy is a requirement in order to become a candidate in the forthcoming barangay and SK polls. Being illiterate is one of the grounds for disqualification of a candidate. There are times however, that candidates who do not know how to read or write are able to run for barangay positions. There are times when the one who receives the certificate of candidacy cannot check if the candidate is literate or not. For one, the Certificate of Candidacy may be filed by an authorized representative. The form would already be filled up. The remedy, the Comelec informed, is to file a disqualification case. However, Jimenez said that there are usually few disqualification cases filed during barangay elections against a candidate who cannot read or write. What is most effective is not to vote for the illiterate candidate so that he will not win. What is important is communication and information dissemination within the community. The barangay captain is the executive head of the smallest unit of government. He is in charge of governance, fiscal administration, development planning, barangay legislation, basic services and facilities and compliance to directives. The responsibilities of this job require the barangay officials’ full attention. They cannot be accomplished half-heartedly because public service demands the barangay officials’ complete commitment. Since they are the primary link of the government to the grassroots, the job of barangay officials is a sensitive one. As such, the voters must always remember that the efficacy of governance is enhanced or worsened depending on the performance of the barangay officials. Being the smallest government unit, the barangay is the foundation on which the rest of the state’s institutions are built. If the Philippines is to progress as a nation, it is imperative that the foundation of government be rock-solid lest the whole structure crumbles. The Barangay chairman is the Chief Executive of the barangay; he is the Presiding Officer of the Sangguniang Barangay; and he is the Chief Magistrate of the Lupong Tagapamayapa. In a manner of speaking, the Barangay Chairman is President, Speaker and Chief Justice. Truly, he is the greatest functionary and to be able to such, he must know how to read and write. In response to reports which stated that BT Brinjal is produced by Monsanto, and/or in partnership with Mahyco, Monsanto’s Corporate Affairs Lead, Charina Ocampo, clarified that these reports are inaccurate. BT Brinjal has been indigenously developed by the Indian seed and biotech company – Mahyco, in collaboration with public sector institutions. Ocampo said Mahyco has independently conducted Bt Brinjal research for over nine years now in full compliance with the guidelines and directives of the regulatory authorities to ensure its safety; making Bt Brinjal the most rigorously tested vegetable with 25 environmental biosafety studies. Meantime, Monsanto’s association with Mahyco is restricted only to the extent of a minority stake of 26% in the company, through Monsanto Holdings Pvt. Ltd. (MHPL) – a 100% subsidiary of Monsanto Company, USA. Ocampo said that Monsanto will continue to conduct research in compliance with the Philippine regulatory protocols. “Our regulatory protocols have been established in 1990 by Executive order No 430 issued by the late President Corazon Aquino. Since then, there was not one case, documented or otherwise, which would indicate that our regulators failed to exercise utmost diligence,” said Ocampo. “The presidents who succeeded President Aquino, namely Fidel Ramos, Joseph Estrada and Gloria Arroyo, have all indicated continued support for biotechnology as an important focus of our country’s research and development program. Monsanto is one of the world’s leading providers of agricultural products and solutions to farmers. The company has over three decades of presence in the Philippines and is involved today in the promotion of modern agricultural biotechnology. Monsanto is also taking the lead in educating Filipino farmers in using biotech products to achieve the country’s aim of food security and sufficiency. Monsanto is also committed to share to the agricultural community the belief that the improvement of farm productivity need not be done at the cost of damaging the environment. This reflects Monsanto’s worldwide commitment to environmental protection. CATBALOGAN, Samar – The Asia Foundation through its Director of Programs, Ms. Maribel T. Buenaobra, assures the Samar Island Partnership for Peace and Development (SIPPAD) a strengthened partnership in terms of financial assistance in the pursuance of its advocacies relative to good governance, human trafficking, armed conflict management and more other relevant issues. This was manifested during a forum held at RSCJ-SHIFT, Sophie’s Farm in Barangay Dona Lucia, Mondragon, Northern Samar, where Ms. Buenaobra attended. SIPPAD was positively identified by DILG Secretary Robredo as a potential beneficiary of projects in one of his speaking engagements in Metro Manila, Buenaobra informed. It may be recalled that during Sec. Robredo’s guesting at the Samar Island Partnership for Peace and Development (SIPPAD) forum held in Maqueda Hotel, Catbalogan last September 22, the necessity of establishing transparency and accountability networks with the Civil Society Organizations (CSOs) was highly recognized. In line with the activity’s theme, “Good Governance: A development imperative for Samar Island”, the secretary shared his leadership experience as a Local Chief Executive for 19 years in Naga City where he focused on capacitating the private sector in getting informed and engaged in his governance efforts. According to him, an existing collaborative mechanism such as the SIPPAD in Samar, is commendable and will surely bring Samar towards progress and development. The Samar Island Partnership for Peace and Development (SIPPAD) is participated by three (3) peace and development networks namely; the Eastern Samar Peace and Development Forum (ESPDF), the Samar Partnership for Peace and Development (SPPADE), and the Northern Samar Peace and Development Forum (NSPDF). Its Executive Committee is composed of Bishop Isabelo Abarquez of the Diocese of Calbayog, Bishop Emmanuel Trance of the Diocese of Catarman and Bishop Crispin Varquez of the Diocese of Borongan. Recently, the Asia Foundation has been working with the Social Weather Stations (SWS) for the conduct of the 2010 Post-election Surveys that aimed to obtain the voting public’s perspectives on the first ever nationwide automated elections in the country particularly with the use of the new technology to cast and count votes. Ms. Linda Luz Guerrero, SWS Vice-President, presented during the Mondragon forum, the survey’s findings. In so far as the consensus of the Filipinos was concerned, 75% were generally satisfied with the conduct of the May 2010 elections, SWS confirmed. However, the issue on vote buying was raised and the immediate undertaking of a massive values education and citizen empowerment were proposed to arrest the problem. In this regard, the Asia Foundation offered to support project proposals that will be initiated by the SIPPAD. 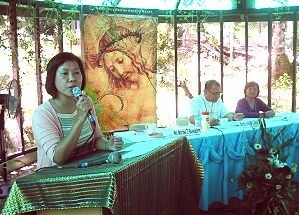 Moreover, the “People’s Evaluation of the May 2010 Automated System” held at the Sophie’s Farm was part of the pubic presentations throughout the Philippines on the 2010 post-election survey results conducted by the SWS with the Asia Foundation. In the island of Samar, the presentation was facilitated by the Northern Samar Peace and Development Forum (NSPDF) under the sponsorship of the Asia Foundation. “It was made possible by the generous support of the American people through the United states Agency for International Development (USAID),” Sister Lydia Collado stressed. TACLOBAN CITY – The National Statistical Coordination Board (NSCB) in Eastern Visayas through its regional head, Ms. Evangeline M. Paran, presented the Millennium Development Goals (MDG) Progress Report for Eastern Visayas during the 21st National Statistics Month kick-off program held last October 1, 2010 at the Robinsons Mall activity area this city. The goals include: to eradicate extreme poverty and hunger; achieve universal primary education; promote gender equality and empower women; reduce child mortality; improve maternal health; combat HIV/AIDS, malaria and other diseases; and ensure environmental sustainability. For goal 1, which is to eradicate extreme poverty and hunger, the probability of attainment is medium-paced and the international target is to halve, between 1990 and 2015, the proportion of people whose income is less than one dollar a day and the proportion of people who suffer hunger. For goal 2, which is to achieve universal primary education, the target is to ensure that, by 2015, children everywhere, boys and girls alike, will be able to complete a full course of primary schooling and the probability of attainment is low. Goal 3 is to promote gender equality and empower women has a low probability of attainment. The target is to eliminate gender disparity in primary and secondary education to all levels of education not later than 2015. Goal 4 target is to reduce by two-thirds, between 1990 and 2015, the under-five mortality rate and the probability of attainment based on NSCB’s statistical analysis is medium-paced. Goal 5 has a low probability of attainment in the improvement of maternal health which targets to reduce by three-quarters, between 1990 and 2015, the maternal mortality ratio. A medium probability of attainment was noted in Goal 6 which targets to have halted by 2015 and begun to reverse the incidence of malaria and other diseases. Indicators in this goal include the prevalence associated with dengue and death rate associated with tuberculosis. Only Goal 7 has the high probability of attainment which targets to halve, by 2015, the proportion of people without sustainable access to safe drinking water and basic sanitation and to have achieved, by 2020, a significant improvement in the lives of at least 100 million slum dwellers. Paran emphasized that the statistical data she presented is important as it will serve as a guide which of the Millennium Development Goals will be given more attention and focus. MDG is a set of time-bound and measurable goals and targets for combating poverty, hunger, diseases, illiteracy, environmental degradation and discrimination against women. TACLOBAN CITY – The Philippine Health Insurance Corp (Philhealth) was able to issue about 5,183 cards to the disadvantaged families in Eastern Visayas during the national Philhealth Registration dubbed as Philhealth Sabado on October 2. Mr. Asisclo Militante, division chief of PhilHealth Region 8 informed the Philippine Information Agency that those issued with PhilHealth cards were those identified through the National Household Targeting System (NHTS) of the DSWD. This is 183 more than the 5,000 cards targeted to be issued, Mr. Militante added. PhilHealth Sabado was able to register 6,851 new members in the various offsite registration areas in the region, Mr. Militante informed, adding that the PhilHealth Sabado in Eastern Visayas was very successful. For the education and information campaign through the PhilHealth Information Desks, Mr. Militante said that the crowd estimate is 13,054. Mr. Militante commended the members of the PhilHealth Registration Task Force in the Region for really doing their assigned tasks. The taskforce is composed of the Department of Health, PhilHealth, Department of Education, the Department of Interior and Local Government and the Department of Social Welfare and Development. Mr. Militante reiterated that the path towards universal health care does not stop with the PhilHealth Sabado. Registration for the sponsored program of PhilHealth will continue until the 55,000 indigent and poor families targeted for the Region this year is achieved, Mr. Militante added. Mr. Militante said that the 55,000 members targeted for this year are sponsored by the government which will pay for their premium contributions for the next 5 years. Philhealth Sabado is a joint effort of the Departments of Health, the Philippine Health Insurance Corp. (PhilHealth), Local Government Units (LGUs) and various volunteer organizations aimed to promote public awareness of PhilHealth’s importance, responsibilities and benefits, and more importantly, to encourage the enrollment of the poorest of the poor in the country as identified by DSWD through the National Household Targeting System (NHTS). CATBALOGAN, Samar – As October is considered a scouting month, the Girl Scouts of the Philippines, Samar Chapter launched the activity through a parade on October 1, 2010. Speeches extolled the spirit of scouting in the country and how young girls who are now aged almost a century have done wonders for girls. Yna Sanchez, GSP Council Executive told PIA this year GSP is celebrating its centenary hat during this month most patrol leaders register their girls as most would want to join the myriad scouting activities done in October. For Samar GSP, slated activities like Twinklers Playday, is set. Twinklers are the youngest girl scouts, they are usually enrolled in the nursery or kindergarten. For high School GSP, they will undergo a Junior Journalists Guild Training Workshop in cooperation with PIA-Samar. Finally on the last days of October, a regional encampment is slated in Cap Marina, Cebu City. “Being a girl scout is for me an achievement in itself,” Malinao offered. CALBAYOG CITY – After the court has granted the petition for injunction on the nullification of the 2010 budget of Samar Province, Board Member Noel Sermense testified before the court on Friday how the 6-member Sangguninan approved said ordinance on August 26, 2010 following his dramatic exit with BM Jimmy Dy. In his testimony during direct examination conducted by his counsel Atty. Clemente Rosales, Sermense disclosed that the budget ordinance was not part of the agenda or even in other matters. He recalled that only 8 of them were present when the session started at 11 in the morning such as BM Luzviminda Nacario, BM Juan Latorre, Ex-officio members Joseph Escober and Julius Ramon Vasquez, PCL Quirino Cabella, BM Jimmy Dy and Vice-Governor Stephen James Tan. When all the matters were tackled, he moved for the adjournment of the session but nobody from the body seconded, instead Vice-Governor Tan moved for a recess. He added that he was so surprised when BM Member Arthur Vaughn Zosa arrived in the area before the resumption of the afternoon session, bearing the fact that there was a manifestation in the morning from BM Latorre that Zosa could not attend as he was still recuperating from an operation. Perceiving that the 2010 budget ordinance could possibly be included upon the resumption of the session, he “walked out” from the area and such act was a justification that he would not be amenable should there be a move for inclusion of said ordinance initiated by the body. On the other hand, the respondent’s counsel headed by Atty. Allan P. Rambano asked the court that he would like to have a copy of the petitioner’s testimony before he conducts his cross examination which was scheduled on November 26, 2010. During the hearing, aside from Sermense only Majority Floor Leader Charlie Coñejos and Atty. Jasper Sumagang were around. The latter being one of the counsels for the petitioners. Be it noted that on September 3 press conference at I’s Plant Conference Room this city, Sermense clarified that the 186-pages proposed budget ordinance amounting to P1.2 Billion was still at the committee level and subject for examination before the local finance offices of the province. Atty. Ernesto Arcales further justified that attendance should not be the basis of determining a quorum at the time when the budget was approved for the exit of the two board members has altered it. Their absence should be taken into account by the Secretary. In effect, there was falsification in the consideration of the budget. “Insulto ini san majority,“ Arcales declared. DILG opinion states that the basis of computation in a quorum is the number of member i.e. total composition of the council regardless of vacancies – there is a quorum if one-half of the members plus one is present at a Sanggunian session. Since the Sanggunian is composed of 14 members including the Vice-Governor, the majority should be 8, said Arcales. But while the 2010 budget is under question, Samar province is operating on a P600 Million plus 2008 reenacted budget. CATBALOGAN, Samar – The 8th Infantry Division (Stormtroopers) welcomed guests, friends, relatives and parents of the 235 newly inducted soldiers of Class 02-10, Friday morning, as they received their Certificates of Completion in the Jungle Warfare and Mountains Operations Course. Simultaneously, the Ceremonial Entrustment of Firearms to the graduates and their deployment to the respective units were publicly made. Originally, there were 250 candidate soldier applicants who qualified in the final board screening that was conducted. Out of the 250 applicants, six (6) went on an Absence without Leave (AWOL) and four (4) others voluntarily gave up on August. Four (4) more left the training before the culmination of the Jungle Warfare Operation Course. The 235 graduates were the survivors from the academic and non-academic trainings that they undertook since May 13 to September 30, 2010. Initially, the group is part of the 1,069 quota allocated for the 8ID, this year. It was learned that the biggest quota for recruitment in the Philippine Army was availed by the 8th Infantry Division. Based on the statistics presented by MGen. Mario F. Chan, the ages of applicants range from 18 to 25 years old. At least, 39 were college graduates, 103 were in their college level and 93 were graduates of a secondary education. The distribution of the applicants in terms of their home provinces are as follows: Northern Samar, 36; Western Samar, 97; Eastern Sama, 51; Leyte, 37; Mindanao, 10; and Luzon, 4. General Chan informed that their ATMs are yet to be released on October 7 and an accumulated savings in the amount of P13,284 for a period covering August 16 to Sept. 30, 2010 are available for each one of them. 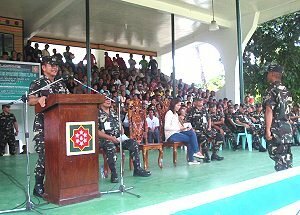 Gracing the occasion was Samar Governor Sharee Ann T. delos Santos who acted as the guest speaker. She was assisted in the distribution of Certificates by MGen. Mario Chan, 8ID Commanding General, Col. Arnulfo Atendido, Assistant Division Commander; and Col. Ray Aninon, Division Training Unit (DTU) Commanding Officer. The program proceeded less formally with the Stormtrooper‘s Band performance that received warm applause from the audience. Likewise, the Commanding General showed the lighter and funnier side of him, when he punches lines and jokes in between his formal speech, which were perceived to be equally entertaining. “This is one of the most entertaining and lively military graduations that we have attended in the 8ID. Gen. Chan made the difference.” observes a media practitioner. Gen. Chan assured everyone of a new breed of protectors of the people, expressing his confidence that the Ten Rules of Engagement are very well inculcated in them. “Soldiers must obey legal orders, must be presentable, not arrogant, be polite and respectful of women and the elderly, pay what is required, do not maltreat prisoners of war and must respect human rights at all times,” says Gen. Chan.